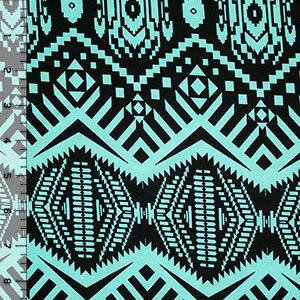 Super soft brushed poly spandex cotton jersey blend knit with a larger scale Aztec emblem inspired design in black and aqua blue. Fabric is light to medium weight, with a nice 4 way stretch, soft hand, and good drape. See image for scale. A versatile fabric great for many uses!